We have helped hundreds of food brands to find packaging solutions that are fit for purpose and visually appealing. Whether you are researching packaging options, undergoing a redesign or manufacturing a new range of products, exceptional flexibility in packaging is critical for all stakeholders in the food industry. 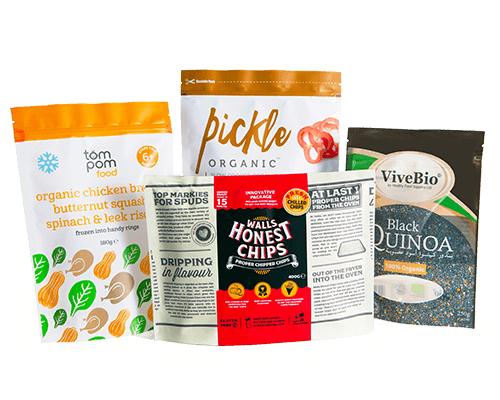 Given its value to both brands and consumers, flexible packaging is the perfect solution for your food product to help build your brand awareness and increase your market share. Flexible packaging provides a creative canvas to promote the nutritional value of the product inside while packaging materials provide barrier properties to protect and enhance the products shelf life. Today’s market challenges are being met with the development of packaging that not only protects and promotes the product, but also has a lesser effect on the wider environment. foxpak are pioneers in the development of sustainable packaging which includes compostable, recyclable and paper options. Thanks to our expert knowledge, innovative ideas and technology know-how, we can help you develop efficient and eco-friendly packaging solutions that inspire your customers, stand out on the shelf and ultimately boost your bottom line. Flexible packaging is lightweight, easy to open, carry, store and reseal with features such as resealable zip locks. The convenience factor makes food products more attractive to consumers, which translates to greater sales opportunities for brands. By leveraging materials that are capable of controlling the transmissions of oxygen, water vapor and C02, flexible packaging can effectively preserve and prolong the shelf life of the food product it holds. Effective food packaging protects its contents in order to minimize food waste. Effective food packaging must utilise high quality visuals to help stand out from competition as oftentimes, the first exposure consumers have to your products is the pack it is contained in. Flexible packaging provides an opportunity for brands to maximize shelf appeal, make their products more visible and employ creative presentation and marketing options. A versatile food packaging format that can stand upright on shelves, protect and prolong your product and is easy to pack and display on store shelves. Ranging in shape and size, stand up pouches are fully customisable to your product and brand. A striking packaging format that is growing in popularity among retailers and food manufacturers. With expanding side gussets and four corner seals this format is strong enough to hold large volumes of food while remaining visually appealing on the shelf. 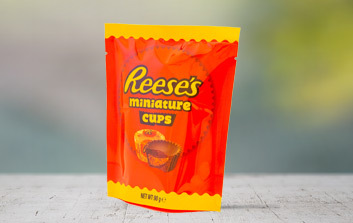 The nature of this adaptable packaging format makes it the perfect solution for packing anything from single serve snack size products to large volume wholesale foods. 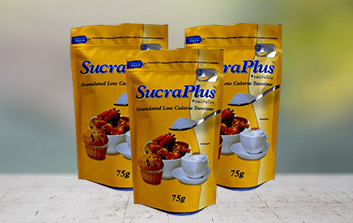 The 3-side seal pouch is the packaging of choice when it comes to maximising sales of food products. The flat bottom bag benefits from full height gussets which allows for larger volumes of food to be packed while efficiently utilising shelf space. Five vertical panels allow for effective brand messaging and vivid product imagery on pack. Available in a range of thicknesses and materials, this is the most versatile food packaging format. Depending on the protection and shelf life requirements of your product we can print and manufacture bespoke laminate blends.